Provide comfort for the family of Judith Harris with a meaningful gesture of sympathy. 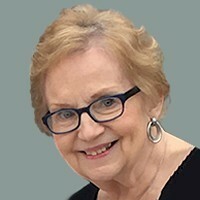 Harris, Judith Mae Age 73, of Edina, passed away December 26, 2018 surrounded by family. She is preceded in death by her husband, Thomas; parents, Stanley and Joyce; brother, Gary; sisters Leslie and Nikki. She is survived by her daughter, Kristen (Jeff); grandsons, Charlie (Heather) and Cory (Chelsea); granddaughter, Sierra (Jeff); great-grandchildren, Lorelai and Jasper; brother, Donald (Diane); and many other loving relatives and friends. Judith was so gentle and kind, generous, always welcoming, and a strong prayer warrior who loved Jesus with her whole being and her family without question or hesitation. A memorial service will be held on Saturday, January 12 at 11:00 AM with a visitation 1-hour prior, at Mound Evangelical Free Church, 2117 Commerce Blvd, Mound, MN 55364.